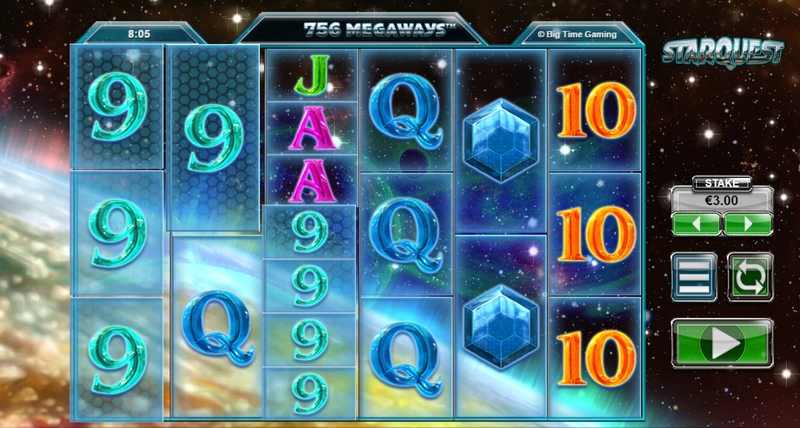 Space and gambling don’t usually go together, but with Starquest, it seems to be the perfect recipe. Set in deep space surrounded by shooting stars and desolate planets, Starquest takes you on a mesmeric journey into a new universe. This 6-reel slot has a maximum of 7 symbols per reel and an enormous 117,649 mega ways to win on every spin. Accompanied with Full Reel Wilds and a Re-Spin Wilds Feature, you’re more than equipped to hit some incredible wins. Ready up and propel yourself into the unknown to see what rewards await you here on Easy Slots. And play online slot games! The eerie sound of mystery greets you as you dive into the action of Starquest. 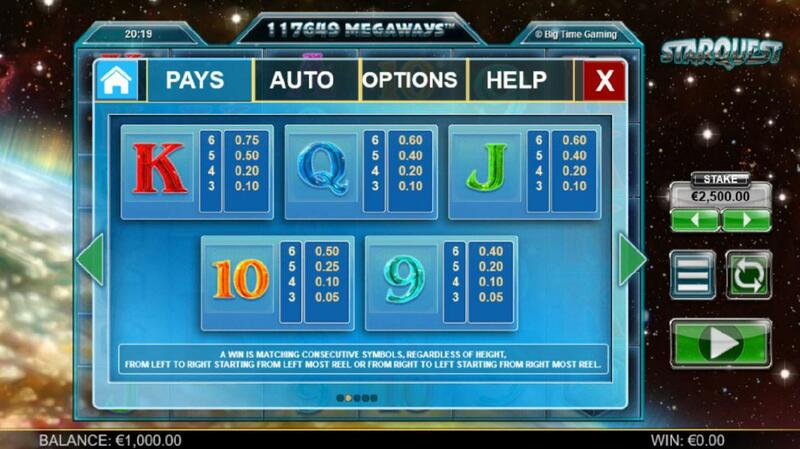 6 reels and 117,649 mega ways to win is a rare setup when it comes to slots, but not with Big Time Gaming. As you start to spin, you’ll soon realise that the symbols are split into low and medium values. The low value symbols being playing cards from 9 to K and the medium value symbols are; Ace, green gems, blue gems, red gems and the Starquest logo. * FULL REEL WILDS – These Full Reel WILDS appear on reels 2 and 5. They have a starting multiplier of 1x and can increase up to 5x if you keep hitting winning combinations. These WILDS substitute for all symbols. * RE-SPINS WILD FEATURE – Upon hitting a Full Reel WILD, a re-spin will trigger and the multiplier will increase. In addition, if a new Full Reel WILD appears during the re-spin, all multipliers are increased and stick as another re-spin occurs. All slot promos available here. Try our mobile billing casino and start playing today! Unlike the majority of Big Time Gaming’s creations, Starquest lacks the power of a Free Spins bonus that can completely transform your playing experience. Sure, the base game can pay well if you hit the right combinations, but the slot definitely misses an exciting bonus. Nevertheless, it’s a Big Time Gaming slot and it still has the potential to pay big due its vast amount of mega ways to win. Manage your bankroll as you try to re-spin your way to a big pay-out, spin the wheel today!